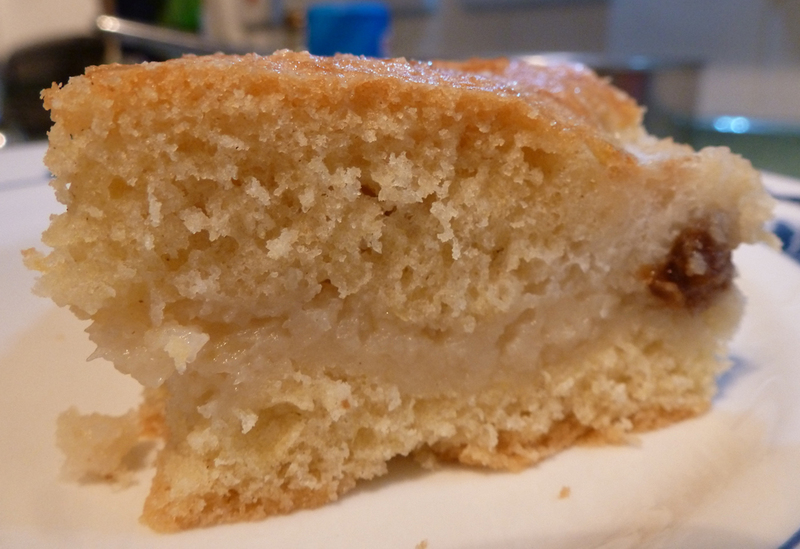 A stiff cake with a crispy glaze, encapsulating a squishy, appley filling. I made this in a tin that was approximately A4 (i.e. 8″ x 11.5″). Preheat the oven to 180°C. Grease the tin. Beat butter and sugar together until fluffy, add eggs one at a time, beating in between additions. Fold in the flour. The mix is somewhere between a cake and a pastry. It’s quite difficult and sticky to work, and you can add a little more flour if it’s very soft. Be ready with lots of flour for rolling out! Use half the dough to line the bottom of the tin. I get halfway there by rolling it as best I can, then I shove it together in the tin with my fingers! Mix the apple puree, breadcrumbs, sugar, sultanas and egg yolk together very thoroughly and pour into case. Roll out the remaining paste and cut into strips to create a basket weave effect on top of the cake. It doesn’t have to be basket-weave – simply flat is fine, or torn into rough shapes, or cut into ‘cobbles’ with a biscuit cutter. The dough is soft and difficult to work, BUT its saving grace is that it puffs up and disguises all your decorative errors! I shouldn't have tried to make a 'basket-weave' top after I'd been to the pub! Never mind - it's puffed up and filled in all my mistakes. Paint it generously with the remaining egg white and dredge with plenty of granulated sugar. Bake for 30 minutes. Using a tray meant this could be cut into finger-food slices, to munch with a cup of coffee. If you want something more grandly ‘puddingy’, you can also make it in a round cake tin. The result is taller and thicker, so will need a few more minutes in the oven. I would give it 40 minutes then check if it’s done by sliding a knife into the centre and seeing if it comes out relatively clean. The round version looks great with the top covered in diamond-shaped pastry pieces, radiating from the centre, like a chrysanthemum. Serve warm with some custard or pouring cream. The lemon/sultana or raisin combination seems to be traditional (this is actually based on a ‘Danish Apple Cake’ from a magazine from 30 years ago, which I then lost and have resurrected in my own form, as usual! 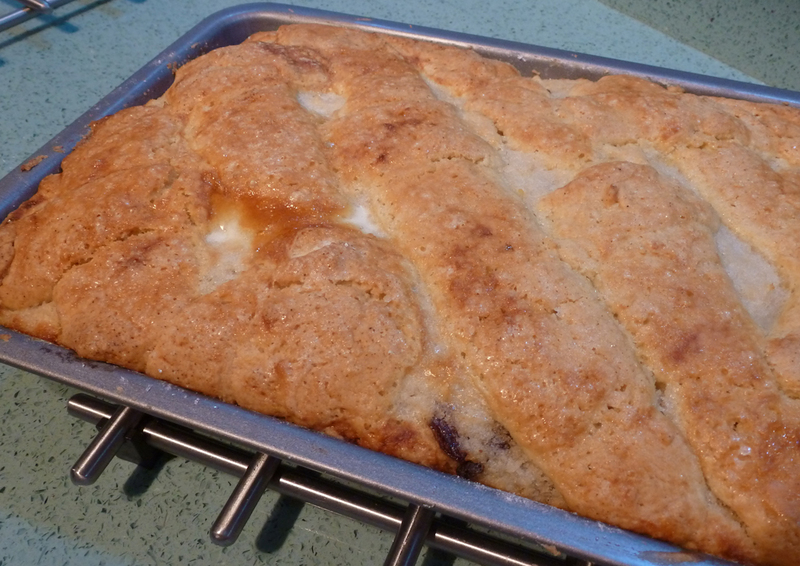 So I daren’t call it ‘Danish Apple Cake’ now…). I’m sure there are lots of other adjustments that would be good… brown sugar, ginger or vanilla added to the ‘pastry’ for instance. Or fresh blackberries or raspberries added to the apple. Cinnamon or cloves could go somewhere, too. All those appley accompaniments can be tested here!